Do you have a child who is longing for a pet but can't have one because of allergies? Do you want a low maintenance pet with a long lifespan and few needs? Then the African Clawed Frog is for you. The African Clawed Frog or Xenopus Laevis is a wonderful pet for people who have allergies or live in a place that doesn't allow furry pets. They also are great learning tools for schoolrooms and for children to learn about how a frog changes from a tadpole to an adult. You can purchase a frog from Grow-A-Frog online, or from the fish section of your local department store. These frogs are used extensively in laboratories for research because of the properties of their skin. They used to be used for pregnancy detection before more sophisticated tests were available and were released into the wild in the USA when they were no longer needed. Because the frogs will eat just about anything and have a long lifespan, they started to threaten the local fish and frog populations, and are therefore not legal in some states. African Clawed Frogs are from the cooler places in Africa. They like to live in areas of stagnant fresh water like ponds, rivers, and pools. For your frog, you will want to buy an aquarium and allow for ten gallons of water per frog. Because your frog breathes air, the water should be six to twelve inches deep so he can swim to the surface easily. The tap water has to sit for 24 hours before you put the frog in it, or use a dechlorinator crystal you can buy from Grow-A-Frog. Frogs are happiest when the water temperature is about 74-78 degrees F, so you may need an aquarium heater. A filter can be used to keep the water clean. Whether or not to use gravel or stones on the bottom of the tank is debatable. Some frogs will eat the gravel if it is small, and they could die. If the stones are big enough, you could put them on the bottom. Also, provide your frog with some cover to hide, with plastic plants and decorations. Don't use real plants, because your frog will destroy them. Be sure to have a tight fitting lid on the top of the aquarium. Your frog is a master at escape and can jump right out of most places. You don't have to use direct light or artificial light for your frog. They like indirect light the best. African Clawed Frogs are not fussy eaters. You can feed them the prepared fish pellets from Grow-A-Frog, or you can feed them brine shrimp, meal worms, guppies, or Tetra Rept-min. They will even eat the fish in your aquarium, so be careful you don't put them in a tank with little fish. 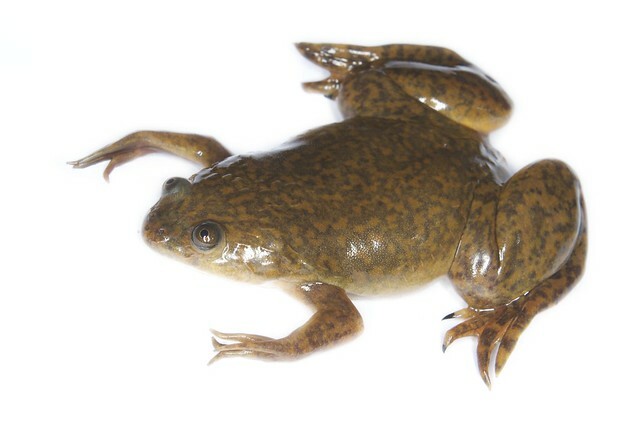 These frogs have an official lifespan of eight to ten years in captivity, but most African Clawed frog owners will tell you their frogs can live fifteen to twenty + years. Clean the water once a week, less if you use a filter. Feed him. Watch him (don't hold the frog; they have chemicals in their skin which may cause an allergic reaction for some people). Listen to him sing! (males sing, females don't). 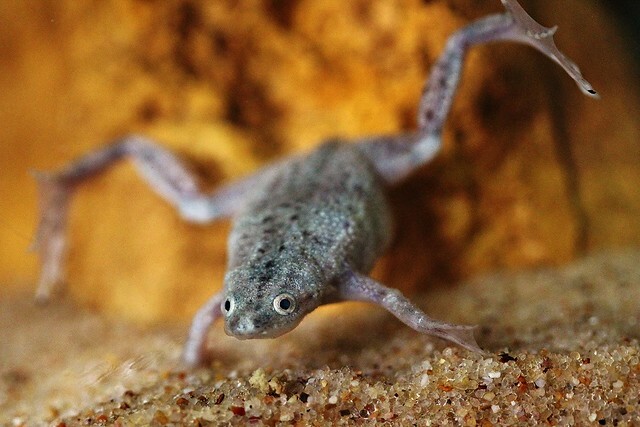 The African Clawed frog if bought as a tadpole is a great learning tool for children. They will get to watch the frog grow from tadpole to adult swimming frog. If you buy a male and a female frog, with some luck, you can watch the mating process and enjoy the babies that may result. The male frog has interesting vocalizations for different occasions. There is the 'feed me' song, the 'I want a mate' song, and the singing for singing sake song. Both sexes use their front legs to grab and eat, and look like they are begging for more food. If you want a non-allergic pet with interesting habits and simple requirements, than the African Clawed Frog is for you! Mary Casey is the proud owner of a sixteen-year-old African Clawed Frog named Mup.